Rose has decided that this year, she is going to be the winner of a beauty pageant - EASY. Ella wants to be water fairy - I have no idea what "water fairy" means. Rose has this idea from watching too much Toddlers & Tiara's (ok, I admit, I have complete control of the remote and do secretly like this show too). She wants a big poofy dress with tons of sparkles, BIG Marilyn Monroe hair, a sparkly sash, and a giant tiara. She'd probably like her own personal spray tan session too. (not gonna happen, kiddo) This should be pretty simple considering we've got a dress in her closet from her latest duty as flower girl in my Aunt's wedding. I've got the Aqua Net, a teasing comb, and some major big hair experience from the 80's and 90's. I will plan to make a sash with 3" satin ribbon and some glitter glue. The only thing I will be on the hunt for is the head-tipping tiara. Ah, and for Ella - I simply need to figure out what the heck she is talking about so I can start dreaming up her creative costume too! I will let you know what I find out about it. 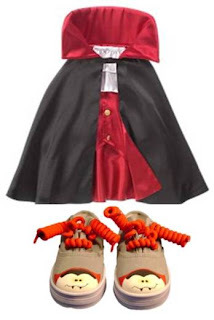 For business purposes (I do work occasionally), I have scoured the internet for fun costumes to match some of Monkey-Toes designs and came up with the cutest stuff this week. In fact, one of the costumes is only $3.99! This costume is from OldNavy.com . 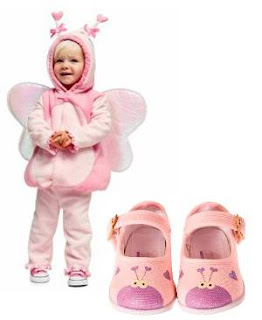 It is $22.50 and runs in sizes 0-5t. It is so freakin cute with our LUV Bugs mary janes. It's as if they were made for each other. I was thrilled when I came across it. Living in Denver my entire life, I have to think about the warmth of a costume too - the weather in Colorado will be perfect until Halloween night and then BOOM - hit with a blizzard. It never fails. This costume actually looks like it would keep your kiddo warm. You could probably even throw a coat underneath it. PERFECT! Now, this one to my right here is the doozie of a find! The Vampire costume from Gymboree.com is only $3.99! No it's not a typ-o, it's TRUE-O! Looks like it is on clearance down from almost $40! And paired with our Crazy Counts - isn't it adorable?? And such a simple costume too - your little blood sucker could wear simple black pants and pretty much any type of shirt under that cape. Find something else that matches Monkey-Toes? Send me a note...maybe, just maybe, I'll post it! Love the vampire. Wish my little guy was old enough to stand! Water Fairies - you must have wings and be in aqua, right?